Minions of Mirth starts HARD. Unlike other games, Minions of Mirth has no long tutorials or trainer levels - the people who play Mirth demanded it be as exciting and immersive as we could make it, so we really do drop you right into the middle of a vast and dynamic monster-filled world. You'll have to learn quickly if you want to stay alive. But if you stick with it through your first few levels you'll soon understand why thousands prefer our dynamic fantasy world over those other, corporate, predictable online-games. It's understandable if you may be a little unsure about where you should go first! But always remember the in-game encyclopedia can answer a lot of questions, and there's usually someone in the global chat that can answer a question or two. Don't worry! There is no penalty for dying for characters under level five! Practice fighting as much as you like when you're a beginner. If you're killed, you don't lose any experience points, skills or equipment. Press J to open the in-game Journal. There's lot of information there that can be helpful. There are many easy-to-kill creatures near the gates of the towns, such as the skeletons and beetles in and around Trinst, or the wild dogs near the gates of Kaldur. Seek out your character class' trainer in town and speak with them about beginning to raise your level. 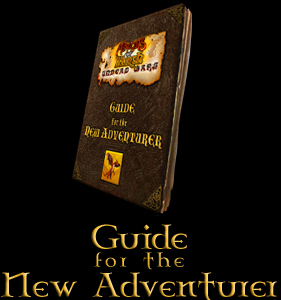 Look through the Getting Started PDF that downloaded with the game. That has a lot of information on gameplay, classes, races, and much, much more.